The Middle Kingdom was a period of Egyptian history spanning the Eleventh through Twelfth Dynasty (2000-1700 BCE), when centralized power consolidated a unified Egypt. The Middle Kingdom had two phases: the end of the Eleventh Dynasty, which ruled from Thebes, and the Twelfth Dynasty onwards, which was centred around el-Lisht. During the First Intermediate Period, the governors of the nomes of Egypt— called nomarchs — gained considerable power. Amenemhet I also instituted a system of co-regency, which ensured a smooth transition from monarch to monarch and contributed to the stability of the Twelfth Dynasty. The height of the Middle Kingdom came under the rules of Sensuret III and Amenemhat III, the former of whom established clear boundaries for Egypt, and the latter of whom efficiently exploited Egyptian resources to bring about a period of economic prosperity. The Middle Kingdom declined into the Second Intermediate Period during the Thirteenth Dynasty, after a gradual loss of dynastic power and the disintegration of Egypt. nomes: Subnational administrative divisions within ancient Egypt. Amenemhat III: Egyptian king who saw a great period of economic prosperity through efficient exploitation of natural resources. Middle Kingdom: Period of unification in Ancient Egyptian history, stretching from the end of the Eleventh Dynasty to the Thirteenth Dynasty, roughly between 2030-1640 BCE. Senusret III: Warrior-king during the Twelfth Dynasty, who centralized power within Egypt through various military successes. Sobekneferu,: The first known female ruler of Egypt. waret: Administrative divisions in Egypt. The Middle Kingdom, also known as the Period of Reunification, is a period in the history of Ancient Egypt stretching from the end of the Eleventh Dynasty to the end of the Twelfth Dynasty, roughly between 2000-1700 BCE. There were two phases: the end of the Eleventh Dynasty, which ruled from Thebes, and the Twelfth Dynasty onwards, which was centred around el-Lisht. Toward the end of the First Intermediate Period, Mentuhotep II and his successors unified Egypt under a single rule, and commanded such faraway locations as Nubia and the Sinai. He reigned for 51 years and restored the cult of the ruler, considering himself a god and wearing the headdresses of Amun and Min. His descendants ruled Egypt, until a vizier, Amenemhet I, came to power and initiated the Twelfth Dynasty. From the Twelfth dynasty onward, pharaohs often kept well-trained standing armies, which formed the basis of larger forces raised for defense against invasion, or for expeditions up the Nile or across the Sinai. However, the Middle Kingdom remained defensive in its military strategy, with fortifications built at the First Cataract of the Nile, in the Delta and across the Sinai Isthmus. Amenemhet I never held the absolute power commanded, in theory, by the Old Kingdom pharaohs. During the First Intermediate Period, the governors of the nomes of Egypt— nomarchs—gained considerable power. To strengthen his position, Amenemhet required registration of land, modified nome borders, and appointed nomarchs directly when offices became vacant. Generally, however, he acquiesced to the nomarch system, creating a strongly feudal organization. In his 20th regnal year, Amenemhat established his son, Senusret I, as his co-regent. This instituted a practice that would be used throughout the Middle and New Kingdoms. The reign of Amenemhat II, successor to Senusret I, has been characterized as largely peaceful. It appears Amenemhet allowed nomarchs to become hereditary again. In his 33rd regnal year, he appointed his son, Senusret II, co-regent. There is no evidence of military activity during the reign of Senusret II. Senusret instead appears to have focused on domestic issues, particularly the irrigation of the Faiyum. He reigned only fifteen years, and was succeeded by his son, Senusret III. Senusret III was a warrior-king, and launched a series of brutal campaigns in Nubia. After his victories, Senusret built a series of massive forts throughout the country as boundary markers; the locals were closely watched. Statue head of Sensuret III: Statue head of Sensuret III, one of the kings in the Twelfth Dynasty. Domestically, Senusret has been given credit for an administrative reform that put more power in the hands of appointees of the central government. Egypt was divided into three warets, or administrative divisions: North, South, and Head of the South (perhaps Lower Egypt, most of Upper Egypt, and the nomes of the original Theban kingdom during the war with Herakleopolis, respectively). The power of the nomarchs seems to drop off permanently during Sensuret’s reign, which has been taken to indicate that the central government had finally suppressed them, though there is no record that Senusret took direct action against them. The reign of Amenemhat III was the height of Middle Kingdom economic prosperity, and is remarkable for the degree to which Egypt exploited its resources. Mining camps in the Sinai, that had previously been used only by intermittent expeditions, were operated on a semi-permanent basis. After a reign of 45 years, Amenemhet III was succeeded by Amenemhet IV, under whom dynastic power began to weaken. 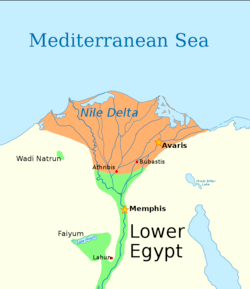 Contemporary records of the Nile flood levels indicate that the end of the reign of Amenemhet III was dry, and crop failures may have helped to destabilize the dynasty. Furthermore, Amenemhet III had an inordinately long reign, which led to succession problems. Amenemhet IV was succeeded by Sobekneferu, the first historically attested female king of Egypt, who ruled for no more than four years. She apparently had no heirs, and when she died the Twelfth Dynasty came to a sudden end. After the death of Sobeknefru, Egypt was ruled by a series of ephemeral kings for about 10-15 years. Ancient Egyptian sources regard these as the first kings of the Thirteenth Dynasty. After the initial dynastic chaos, a series of longer reigning, better attested kings ruled for about 50-80 years. The strongest king of this period, Neferhotep I, ruled for 11 years, maintained effective control of Upper Egypt, Nubia, and the Delta, and was even recognized as the suzerain of the ruler of Byblos. At some point during the Thirteenth Dynasty, the provinces of Xois and Avaris began governing themselves. Thus began the final portion of the Thirteenth Dynasty, when southern kings continued to reign over Upper Egypt; when the unity of Egypt fully disintegrated, however, the Middle Kingdom gave way to the Second Intermediate Period. The Second Intermediate Period (c. 1650-1550 BCE) spanned the Fourteenth to Seventeenth Dynasties, and was a period in which decentralized rule split Egypt between the Theban-based Seventeenth Dynasty in Upper Egypt and the Sixteenth Dynasty under the Hyksos in the north. Explain the dynamics between the various groups of people vying for power during the Second Intermediate Period. The brilliant Twelfth Dynasty was succeeded by a weaker Thirteenth Dynasty, which experienced a splintering of power. The Hyksos made their first appearance during the reign of Sobekhotep IV, and overran Egypt at the end of the Fourteenth Dynasty. They ruled through the Fifteenth and Sixteenth Dynasties. The Abydos Dynasty was a short-lived Dynasty that ruled over part of Upper Egypt, and was contemporaneous with the Fifteenth and Sixteenth Dynasties. The Seventeeth Dynasty established itself in Thebes around the time that the Hyksos took power in Egypt, and co-existed with the Hyksos through trade for a period of time. However, rulers from the Seventeenth Dynasty undertook several wars of liberation that eventually once again unified Egypt in the Eighteenth Dynasty. Baal: The native storm god of the Hyksos. Second Intermediate Period: Spanning the Fourteenth to Seventeenth Dynasties, a period of Egyptian history where power was split between the Hyksos and a Theban-based dynasty in Upper Egypt. Hyksos: An Asiatic people from West Asia who took over the eastern Nile Delta, ending the Thirteenth dynasty of Egypt and initiating the Second Intermediate Period. Abydos Dynasty: A short-lived local dynasty ruling over parts of Upper Egypt during the Second Intermediate Period in Ancient Egypt. The Second Intermediate Period (c. 1782-1550 BCE) marks a time when Ancient Egypt once again fell into disarray between the end of the Middle Kingdom, and the start of the New Kingdom. It is best known as the period when the Hyksos, who reigned during the Fifteenth and Sixteenth Dynasties, made their appearance in Egypt. The brilliant Egyptian Twelfth Dynasty— and the Golden Age of the Middle Kingdom— came to an end around 1800 BCE with the death of Queen Sobekneferu (1806-1802 BCE), and was succeeded by the much weaker Thirteenth Dynasty (1803-1649 BCE). Pharoahs ruled from Memphis until the Hyksos conquered the capital in 1650 BCE. The Thirteenth Dynasty proved unable to hold onto the long land of Egypt, and the provincial ruling family in Xois, located in the marshes of the western Delta, broke away from the central authority to form the Fourteenth Dynasty. The capital of this dynasty was likely Avaris. It existed concurrently with the Thirteenth Dynasty, and its rulers seemed to be of Canaanite or West Semitic descent. Fourteenth Dynasty Territory: The area in orange is the territory possibly under control of the Fourteenth Dynasty. The Hyksos made their first appearance in 1650 BCE and took control of the town of Avaris. They would also conquer the Sixteenth Dynasty in Thebes and a local dynasty in Abydos (see below). The Hyksos were of mixed Asiatic origin with mainly Semitic components, and their native storm god, Baal, became associated with the Egyptian storm god Seth. They brought technological innovation to Egypt, including bronze and pottery techniques, new breeds of animals and new crops, the horse and chariot, composite bow, battle-axes, and fortification techniques for warfare. These advances helped Egypt later rise to prominence. This dynasty ruled the Theban region in Upper Egypt for 70 years, while the armies of the Fifteenth Dynasty advanced against southern enemies and encroached on Sixteenth territory. Famine was an issue during this period, most notably during the reign of Neferhotep III. The Abydos Dynasty was a short-lived local dynasty that ruled over part of Upper Egypt and was contemporaneous with the Fifteenth and Sixteenth Dynasties c. 1650-1600 BCE. The royal necropolis of the Abydos Dynasty was found in the southern part of Abydos, in an area called Anubis Mountain in ancient times, adjacent to the tombs of the Middle Kingdom rulers. 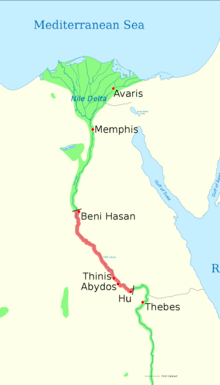 The Abydos Dynasty: This map shows the possible extent of power of the Abydos Dynasty (in red). Around the time Memphis and Itj-tawy fell to the Hyksos, the native Egyptian ruling house in Thebes declared its independence from Itj-tawy and became the Seventeenth Dynasty. This dynasty would eventually lead the war of liberation that drove the Hyksos back into Asia. The Theban-based Seventeenth Dynasty restored numerous temples throughout Upper Egypt while maintaining peaceful trading relations with the Hyksos kingdom in the north. Indeed, Senakhtenre Ahmose, the first king in the line of Ahmoside kings, even imported white limestone from the Hyksos-controlled region of Tura to make a granary door at the Temple of Karnak. However, his successors—the final two kings of this dynasty—,Seqenenre Tao and Kamose, defeated the Hyksos through several wars of liberation. With the creation of the Eighteenth Dynasty around 1550 BCE, the New Kingdom period of Egyptian history began with Ahmose I, its first pharaoh, who completed the expulsion of the Hyksos from Egypt and placed the country, once again, under centralized administrative control.